An 18-year-old man has been charged in connection with alleged drug offences in Ellon. Intelligence was gathered that cannabis was being sent to a property in the town and a search warrant was subsequently executed on Saturday (January 6) in the Esslemont Circle area where a quantity of the Class B drug was recovered. A local man was detained a short time later and has been charged in connection with the recovery. A report will be sent to the Procurator Fiscal. 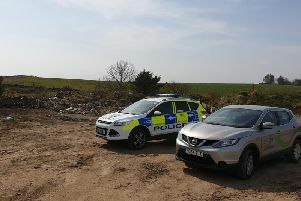 Detective Sergeant Sam Buchan said: "Thank you to those who provided information in connection with this enquiry. As a result of intelligence gathered we have been able to intercept illegal drugs which could have ended up in the local community." He added: "I would once again urge people living in the North East to continue letting us know their concerns when it comes to suspicious activity involving drugs so that we can take targeted action. "No matter where you live the unwanted criminal behaviour that comes with sale and supply of illegal substances can have the same detrimental effect, but by working together with local communities we can make the region an even safer place to live. "Please contact Police on 101 with information or Crimestoppers on 0800 555111 to remain anonymous."